Well what can you say about that one? Anything positive? The map illustrated the story of phone-hacking arrests in London (reported on 29th January) so let's be generous and say that they've managed to name and position the North Sea correctly but after that, well...maybe it was made by one of the 70% of Americans who don't hold a passport? It does very little to dissuade the rest of the world of the view that many American's know anything about world geography. And let's be clear...this wasn't on Fox News (as @iapainter pointed out)...this is CNN! Just to clarify: London has been positioned where Norwich exists. That places it about 120 miles north east of its true location. 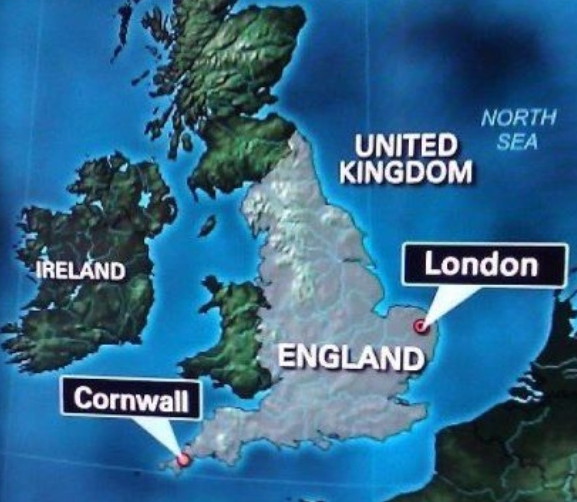 Cornwall (a county) is given a point symbol somewhere near Falmouth. England is labelled (and shaded) but no Wales, Scotland or Northern Ireland. Presumably 'Ireland' relates to the Republic of Ireland but that’s unclear and a ‘United Kingdom’ label is neatly positioned in the North Sea and manages to provide absolutely no indication of precisely what it relates to. 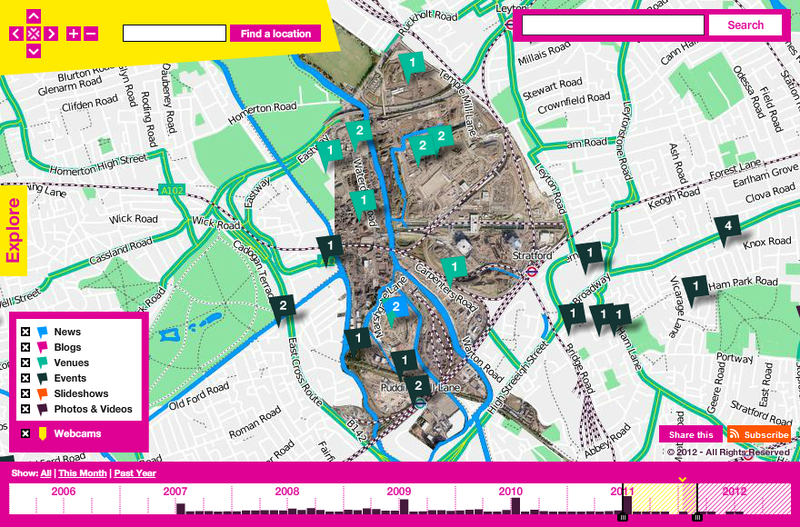 The London Organising Committee for the Olympic Games (LOCOG) has been busy putting together a range of maps to support the 2012 London Olympics. 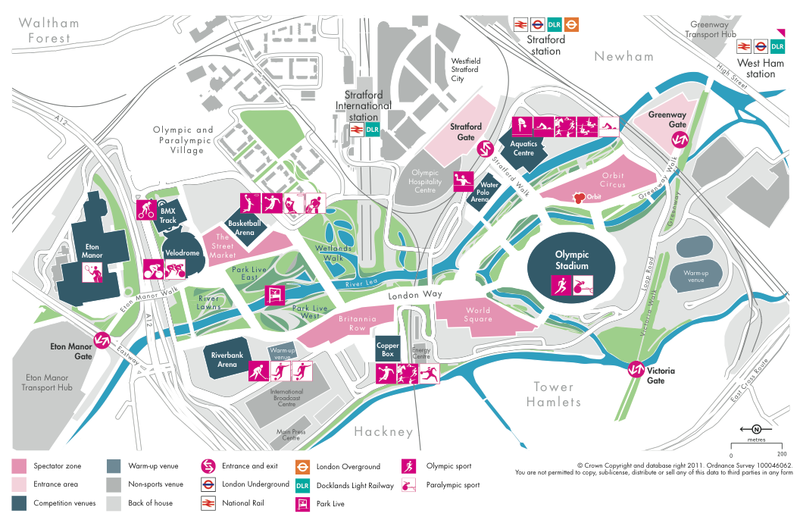 As Ollie O'Brien notes in his Mapping London blog, a new map of the Olympic Park was recently released to add to the collection. 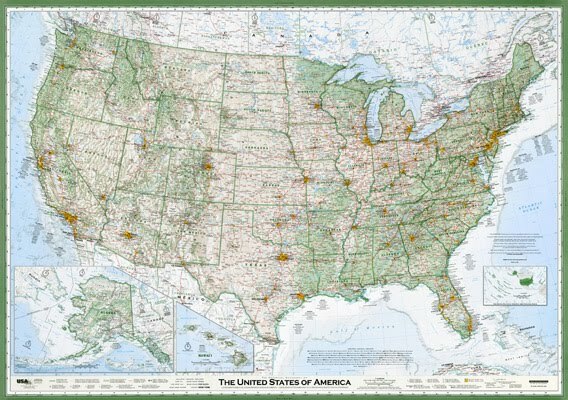 It's a pleasant looking map which uses visual hierarchy to great effect. The background contextual information is predominantly light grey and reflects only the essential geographical detail required to locate yourself or navigate around the Olympic Park. Light grey has also been used to show back of house areas which recedes to the background yet remains an important context for visitors. Colour has been used sparingly but effectively to delineate spectator areas, athlete areas and event arenas. Text is clear and crisp and the switch between light grey, dark grey and white depending on importance and background adds to the structure of the map. Finally, the symbols used to identify the location of entrances, events and transport is clear and placed above the other map detail. This map represents a well structured, clear, unambiguous effort and complements the other static maps thus far. Some may have difficulty with the fact that North is not up (it's left) but given the shape of the Olympic Park it makes perfect sense to represent it in this orientation. You can see the full range of static Olympic venue maps here. The one thing the designers of the static maps illustrate is a clear understanding of the craft of map design. I'd hope that encourages those that made the online web maps on the 2012 Olympic web site to sit up and take notice because thus far, their efforts are truly awful as the following screen grab illustrates.